My main math site, Homeschoolmath.net, has gotten a face-lift... with better NAVIGATION on the left sidebar. Hopefully you'll be able to find your way around better along all the articles, reviews, worksheets, and stuff there. I especially want to draw attention to the ONLINE RESOURCES section. I used to have this on 9 pages... now I split it into 29 different pages, according to topic. Just a fun little song (parody of "I will survive") for all of us who've taken calculus. 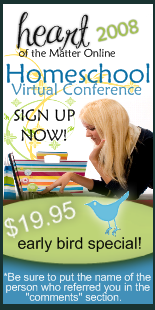 Heart of the Matter will he hosting an online homeschool conference during July 30 till August 3. What is a virtual conference all about? "Each speaker will just log in at her/his scheduled time, with a plugged in microphone, speak about their topic (approximately 30-40 minutes), and then hold a Q/A session with the listeners (approximately 20-30 minutes). All the while the attendees will get to chat amongst themselves in true Instant Message format. We really want the conference to be less like a "seminar" and more like a bunch of close friends in a chat room. We want everyone to feel comfortable. Some sessions will also be pre-recorded. Just wait till you see what some of your favorite home school personalities have done to educate and entertain you! At the end you will join in to chat with them, ask questions, and they will answer." Here's a nice "brain teaser" problem sent to my way... probably a student who wants to know the solution. I'll post it for you all and the solution in a few days. 204 marbles are divided into 3 groups according to colour. Ahmad found that there are twice as many blue marbles as white marbles and there are fewer red marbles than blue marbles. Ben found that the number of marbles in each group are divisible by 4 and 6. Cally found that the number of marbles in each group is less than 100. How many red marbles are there? Now, we need to find three numbers. The one hint tells us that one number is double the other, and the third is less than the first (the doubled one). This won't yet get us started. It is actually the latter hints that provide a starting point. UPDATE: The promotion is extended till the 15th of this month so that all can enjoy it (they've had some problems with so much traffic). I'm sure most of you already know about this... CurrClick is having a mother's day promotion where they have 20 homeschool titles for a free download... and one of them is my Math Mammoth Clock book. Saxon Math uses an "incremental approach" where math concepts are studied in little pieces over several lessons, and those lessons are strawed over a long period of time, intermixed with lessons about other topics. In other words, if one lesson is on some particular topic (say, percentages or inequalities), it's almost guaranteed that the NEXT lesson is NOT on that topic. It jumps around from topic to topic constantly, and this is by design. I should have posted this earlier but forgot. I even missed one day! Learning A-Z is having an open house this week; you can access their family of websites for free, one site per day. The writing site is for today. Vocabulary site is coming up soon, and so is their science site. Lots to explore and download. Today I just stumbled upon two sources discussing the price of gas in a comparative sense; one was a line graph comparing it to the past, the other was a world-wide comparison. Approximately how many-fold is the price of gas in Bosnia-Herzegovina as it is in the USA? In Egypt? In Venezuela? If your mileage is 25 miles per gallon, find the price of driving a 120-mile trip in Germany and in the USA. When was the price of gas at its lowest? At its highest? How much was it? Find the price of gas (approximately) in 1930, 1960, and 1990 by reading the graph. Someone sent in this very simple question (a student?). Leg b of the right triangle is twice as long as the base a. If the area is 36 cm squared, what is the length in of the leg b? A little bit of algebra helps in this problem. So we actually know that b = 2a. area = ba/2 = (2a)(a)/2 , and this is 36 (given). The leg b is therefore 12 cm long. check: Legs are 12 and 6, so the area is 12 * 6 / 2 = 36.